The delegations attending the meeting declared that they acknowledge the basic human rights of all peoples and in particular the right to self-determination of all indigenous people who are oppressed and colonised throughout the world, in accordance with the UN Declaration on the Rights of Indigenous Peoples. The press release also called for the right to self-determination of the Maohi Nui People (Tahiti). The delegates said that the issue of decolonisation has for many years been the focus of the General Assembly of Pacific Churches. They announced their full support for Tahiti to be restored to the UN decolonisation list. Those are the words spat out by police captain Kiki Kurnia, who yesterday (December 1) led hundreds of fully-armed police officers to put a stop to the Long March of students and the people. I was very sad to hear these words so righteously issued by the police, who present themselves as being on the side of safety. Do the police want safety, or do they not? When I was the leader of the Long March headed for Expo Waena on December 1 in Sentani, police backed by the Indonesian military had already closed off access to the people of West Papua who would pray. Since the late afternoon (30/11), Theys H. Eluay field, which is the field of (great significance and sacredness to) the West Papuan national struggle, had been controlled by the military and by the national police, although all the civil society organizations had long since said that their prayers and celebrations would take place there. On November 19, police entered a prayer room in Aula STAKIN in Sentani and tried to stop me as I was giving a reception after prayers, and then yesterday on December 1 the people wanted to worship and eat at the Theys H. Eluay field but were prohibited, blockaded and arrested by the full force of the military. The question is, why did the military and the police force deliberately take control of the field and then shamelessly hold a traditional stone cooking event (a Indonesian-appropriated Papuan Custom) with a handful of residents who were offered money? If the police are tasked with security, why exactly is that security so insecure when facing inhabitants who are conducting prayers peacefully? Is the Theys H. Eluay field, owned by the traditional people of West Papua, only permitted for use by the Indonesian military and the police force? If the law is just, why wasn’t police captain Kiki Kurnia charged with incitement to violence? As he himself clearly (attempted) incited the mass action I led to commit violence on the streets in front of Dian Harapan Hospital yesterday. If the police prohibit students from campaigning to put a stop to AIDS on West Papua’s Independence Day, why must it be prohibited? Do the police not want HIV/AIDS awareness campaigns to take place? Isn’t his proof that the police are ensuring and championing ethnic cleansing in West Papua? Why do the police prevent worship on West Papua’s Independence Day? Why do the police see more political and economic motivations than the goodwill and intentions of the people who want to interpret December 1, 2012 as World AIDS Day, the opening of Christmas festivities and the Independence Day of West Papua? I lead my people safely and with restraint. I have personally guaranteed that I will be arrested or shot if there is a criminal act committed by people, but why in the safe Long March were we forcibly dispersed and captured like animals? Actually, who was it that committed the crime? Was it the people, or the police? The police did not only incite the violence that happened, but yesterday (1/12) the police, through (Adjunct Senior Commissioner) Alfred Papare, publicly lied. Myself and the masses did not throw rocks at the police, however it was covered by several media sources that the police chief said we did so. In an era of openness such as this, why is there a need for mutual deceit when everybody saw yesterday that the police had no reason to blockade, arrest and attack people with tear gas? After I “escaped” from Abepura Sub-District Command, I had not received a call from the Jayapura Chief of Police, the aforementioned Alfred Papare, as stated by Wakapolda Papua, Paulus Waterpau, to Tabloid Jubi. The idea of Papua’s Chief of Police, Tito Karnavian, to give out groceries and distribute help the mountain people of Papua in Jayapura and the Jayapura municipality makes me wonder a little. Has the police chief already switched functions from a chief of police who must preserve security, only to become the head of the Department of Social Services who must give social support to the people? Is this country unhealthy? Money for providing support to the people is redirected into the Police Department and the Police Department takes over the functions of the Department of Social Services. For me, the efforts of the police department to muffle and destroy the basis of the Papua Independence conflict are obviously speculative, as well as inappropriate. Go ahead, if the police department and the Republic of Indonesia believe that our ideology can be bought off with money. Tens to hundreds of millions have been redirected to the Asrama Rusnawa Uncen, since becoming the basis for conflict, and the police are very hopeful that students will regard them as righteous people, as kind people. Well, again, it is better that the Police Institution in Jayapura be renamed as the Department of Social Security or the Department of Education, so that matters concerning the improvement of the Asrama Rusnawa Uncen and student welfare can just be taken over by the police. Does Indonesia believe that money can silence the aspiration and ideology of independence for the people of West Papua? I am convinced the people of Papua that are given money and material aid from the police are only making use of them, because within the individual West Papuan person there is a flesh-and-blood desire for Papuan Independence, however difficult it is. So, go ahead, half-dead police and a waste of money to the people of Papua. Go ahead and pan the sympathy and dreams of the people who have hated the occupation of this land. Almost half a century practicing the policies of the Republic of Indonesia, and all models of development cannot turn the people of West Papua into people of Indonesia. Papua will rise and awaken by itself alone. There are no separatists and terrorists in West Papua; only those who demand the right to self-determination as legally protected under international law. The idea of separatists and terrorists is created by the state to disgrace the legal struggle of the West Papuan people, and created by the Indonesian military and the police with a view to expanding their territory, and their wealth. For the sake of money alone, the circumvention of the state apparatus and the deception of the state apparatus, alias “bullshitting a lot” (direct translation). Why not kill me, or imprison me? Why was I released? Oh, it is certainly not because I cheated. I will see this for what it truly is. There are demonstrations in the streets. Now that I have planted the seeds of resistance here and the invaders sow these seeds with their own actions. I must thank the colonialists for continuously teaching us to aspire to true humanity by means of rebellion. Victor Yeimo wrote this article immediately upon his release from police custody on Monday December 3. JUBI, 9 May 2012Dozens of children from the KINGMI Church in Waena held joint prayers on Wednesday this week, praying for the release of Forkorus Yaboisembut and his four colleagues. They were intending to hold the joint prayers in the grounds of their school in Abepura but because the building was undergoing restoration, the prayers were said at the church. JUBI journalist said that the children were very enthusiastic about the event and had made posters about the many social and political issues in Papua.that have overwhelmed the Papuan people. One of the banners which they unfurled said: ‘We love my father, the President of West Papua.’ As is known, Forkorus Yaboisembut is the president of the Federal Republic of West Papua which was proclaimed on 19 October 2011, at the end of the Papuan People’s Congress. Forkorus and his co-defendants were found guilty of treason and were convicted to three years each. The other four men are: Edison Waromi, Selpius Bobii, Dominikus Sorabat and Agust Makbrawen who are all in custody in Abepura Prison. Demonstrations were held in Jayapura on April 5 in support of a groundbreaking conference held in The Hague, The Netherlands, to examine pathways to the reinstatement of the New Guinea Council or Nieuw-Guinea Raad, the original Parliament of West Papua from 1961 until Indonesia’s invasion. Jayapura was again brought to a standstill by the demonstration organised by the West Papua National Committee (KNPB), where several thousand people gathered hear speeches and to voice their solidarity with the “Nieuw-Guinea Raad: the First Steps” Conference. Indonesian security forces were in attendance in large numbers at the rally, but no act of violence or provocation were reported by rally organisers. 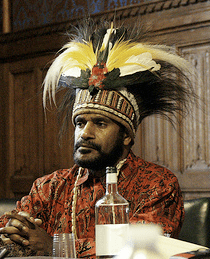 In The Hague, speakers at the conference organised by the International Parliamentarians for West Papua (IPWP) and held at the Dutch Parliament, included exiled UK-based independence figure Benny Wenda, Dutch Parliamentarians including Harry van Bommel, Cees van der Staaij, and Wim Kortenoeven. International Lawyers for West Papua (IPWP) Co-ordinator and international human rights lawyer Jennifer Robinson also spoke, demanding The Netherlands honour its “sacred trust” of its promise of independence for the West Papuan people, and assist West Papuan to fulfil their human right to self-determination. “The Netherlands was to respect the right to self-rule and had to take the political aspirations of the indigenous people into account. 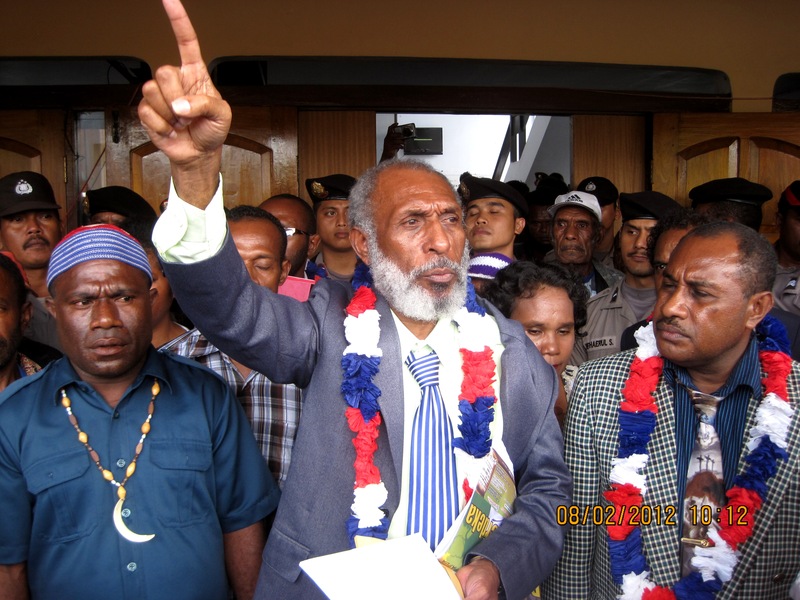 They were also meant to support the Papuan people with the gradual development of their own political institutions. There are documents. 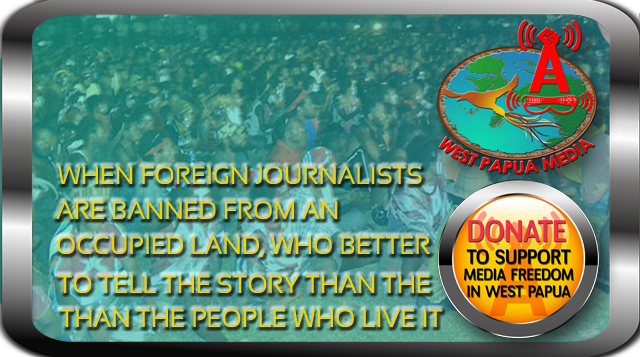 We are not speaking of vague promises, but we are speaking of real firm commitments for the independence of the West Papuan people,” explained a spokesperson for IPWP. “Unfortunately by signing the New York Agreement (1962) the Dutch governments abandoned the West Papuan people,” the spokesperson said.